Home / GlennsPerformance.com 1993 Supercharged LX 5.0 Cover Feature! GlennsPerformance.com 1993 Supercharged LX 5.0 Cover Feature! 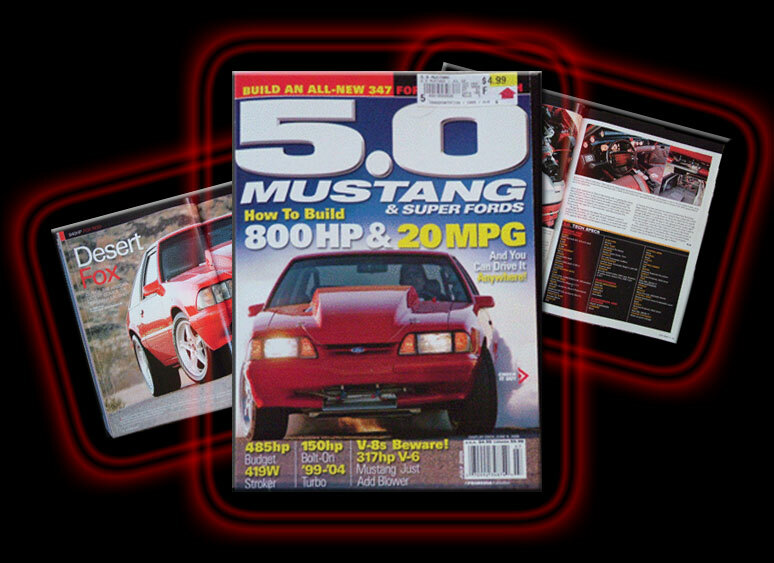 July 2006 issue of 5.0 Mustang and Super Fords! Out of the Arizona Desert Comes the "Kingman Krusher"
Be afraid; be very afraid. Imagine, for a moment, 840 rear-wheel horsepower together with the generous rev-ability permitted by an FRPP 351 race block, all working through a 3.08:1 axle ratio. We can't help but picture an obscene top end, attainable in an instant. For point of reference, your typical Nextel Cup stock car has to get by with somewhere in the neighborhood of "only" 900 ponies at the crank. Glenn is a dude who evidently likes powerful transportation, having previously had a motorcycle that would "wheelie on the highway for five miles." He's also owner of Kingman, Arizona's Glenn's Performance (www.glennsperformance.com), a shop that originally made its name with a Mustang fuel tank dress-up kit and has since branched out into serious mustang fuel system solutions for high-horsepower applications. Turbo and intercooler kits are some of the latest ventures of Glenn's growing company. In a tale that's becoming satisfyingly common, Glenn says he had always been a fan of '60s GM musclecars-until he bought his first Fox, a '90 LX automatic. "It was light, it handled well, and even though it was slow, I loved it!" After he did a little suspension wrenching and slapped on some fat rubber, "it could take anything through the canyons, but straight line was a different story." Being easy meat in the straight sections just wouldn't do, so he peddled the '90, bought this Vermillion Red '93 hatch, and got down to the business of building power. He started with an S-Trim Vortech, a cam, and Victor Jr. heads on a stock 5.0 short-block, which was fine until he "split the block like a watermelon, down the middle." That's when he stepped up to the current Ford Racing 351 four-bolt casting, stroked it to 401 cubes with a Lunati billet-steel crank, and strapped on Crower billet-steel rods and CP blower-friendly pistons, all assembled in his own shop. With such a sturdy bottom to lean on, Glenn ported some AFR 225 heads and an Edelbrock EFI 5.8 intake, and then bolted on Vortech's decidedly race-oriented V-7 YS-Trim centrifugal supercharger. A glance at the accompanying engine photo gives testimony to Glenn's fabricating skills in getting the whole deal plumbed up. Part of that plumbing involves manly 96-lb/hr injectors fed from a Glenn's Performance six-baffle sumped fuel tank. The baffles and gates control fuel movement under longitudinal and lateral g-forces. Another of Glenn's own products is a fuel cooler that's said to eliminate the need for a fuel controller with Aeromotive's Pro Series pump. We get the impression this desert Fox is perpetually a work in progress. At one point-at 12 psi, with 42-lb/hr injectors and still under control of the stock EEC-the car ran a 10.90 e.t. on street tires with a 2.73:1 gearset. Both AOD and five-speed transmissions have been tried to harness the power and, last we heard, a LenTech Strip Terminator Stage 2 AOD-with Overdrive-was onboard. Now tuned with a FAST speed-density setup and cog-driven to 18 psi, the hatch has run mid-9s through 3.08 gears-a combination Glenn tells us still ekes out 17 mpg around town and a frugal 20 mpg on the highway. A nice combo, right? Not nice enough, it seems, as an intercooled, twin-turbo setup is said to be on the horizon-one that Glenn plans to market, so stay tuned. Our advice if you find yourself cruising in the northwest corner of Arizona and a bright red LX hatchback with a 4-inch-cowled Steeda hood ambles up alongside? Pretend you don't see it. The Kingman Krusher may just be looking for another ego to flatten.